Pilotfish is a highly innovative, green and fast-growing company from Sweden that focuses on improving public transport operations. The company leads the industry change from proprietary vendor locked systems to an ecosystem where standardized interfaces and modular application providers is the norm. 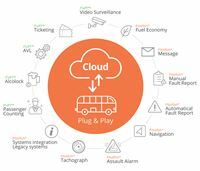 Pilotfish offer consists of an open cloud-based Vehicle Communication Platform and Fleet Management Applications. The technology is based on standards and IT-architecture from the organisation ITxPT (Information Technology for Public Transport) and integrates both standard- and older non-standards system. Pilotfish vision is to improve public transport so that it becomes the preferred choice of travel. The start of the year has been better than we expected and we haven’t even begun to benefit from our partnership with Voith, whose global sales channels and worldwide service organisation we can now offer alongside our own products. It makes life easier for the customer, but also opens for many smaller players to enter the market and compete. We aim to do our share in improving public transport until it becomes everyone's first choice in travel. It needs to be done globally to save the environment. It makes me happy and proud to see that we achieved highest possible grade, 10 out of 10, for all three areas. It’s an important recognition for our work to offer an open, reliable and standardised IT architecture to develop and improve public transport in Europe. Together, we can increase the use of public transport and decrease environmental impact. This award is a receipt that our successful international work is also appreciated at home in Gothenburg. I am extremely proud that the Pilotfish Gateway is the first device to be labeled and approved by ITxPT and that the long and difficult work the association has put into developing the open ITxPT platform has been successful. Pilotfish goes public with all their systems as a logical step after many years of promoting standardization and openness. For Pilotfish, openness is an important part of their growth strategy which means a faster development and increased efficiency in public transport. – We don’t fear competition. We welcome any aid in educating and helping the public transport industry adapt new and smarter IT solutions. Together, we can increase the use of public transport and decrease environmental impact, Tomas Gabinus, Pilotfish CEO states.For Tomas Gabinus, it is important to be a good example.